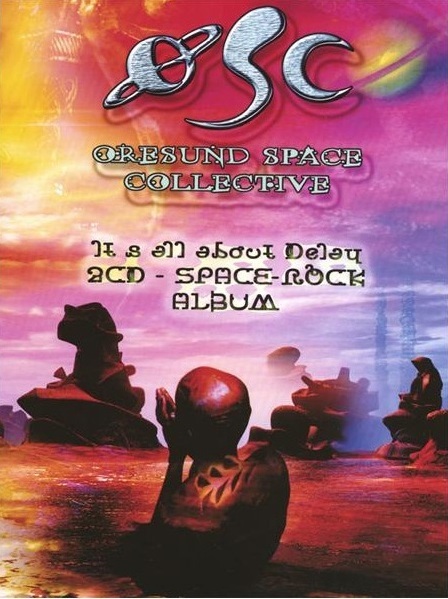 The ØSC web site states “totally improvised space rock!” That was quite evident on their debut release reviewed in Issue #34. A lot of “water has passed under the bridge” since then (10 CDRs culled from improvised jams released in 2006) and It’s All About Delay clearly demonstrates that they are steadily honing their sound. This new double CD set recorded March 10-11th, 2006 at the Black Tornado Studios, Copenhagen shows that more thought has gone into their compositions as well as improving their musicianship. Gone are those odd moments where the guitarist or keyboardist hesitated in the middle of a song. The musicians now seamlessly bounce ideas off each other resulting in roughly three hours of interwoven guitars, synths, bass, congas, and percussion taking you on long excursions of excellent space rock. Many of the tracks remind me of Manuel Göttsching’s guitar ostinatos from his mid-period on. CD1 contains eight relatively short (for OSC) songs with CD2 being by far the best with only four tracks, two of which clock in at over 20 minutes each. One of them “Jupiter Flyby (In Memory of Doug Walker)”, is a fantastic 25 minute improvisation honoring Doug Walker of Alienplanetscapes who passed away a year ago. The band continues to release more music via their web site, two more CDRs this year, a DVD-R from a concert in March 2007, and a new CD, The Black Tomato, set for release in August 2007. ØSC is a band to watch.